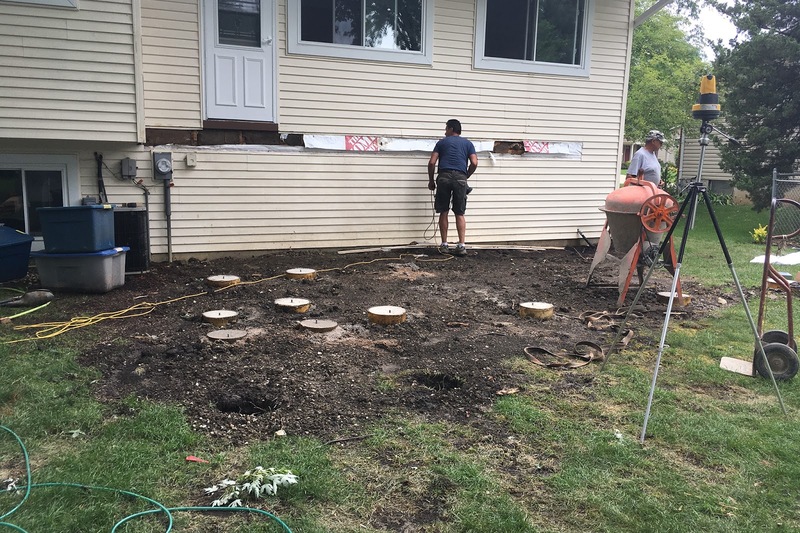 So, the entire summer we've been stressing over and paying installments for a brand new deck! I still have to seal the wood...but here it is! 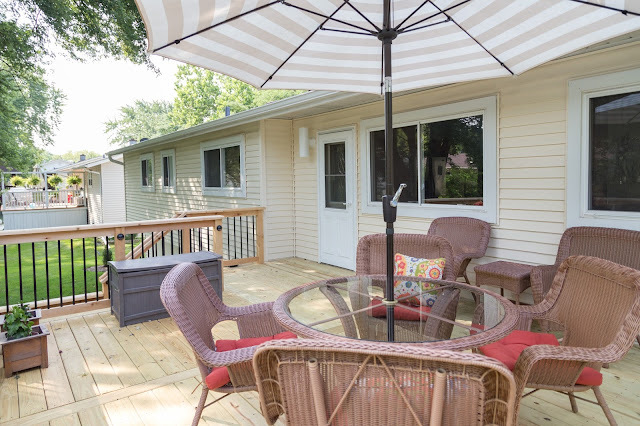 Not sure if I've really shared many photos of the sad 14'x14' deck we had before, but here it is in all it's glory. And the best view, the wonky leaning stairs. This photo is not altered in any way. 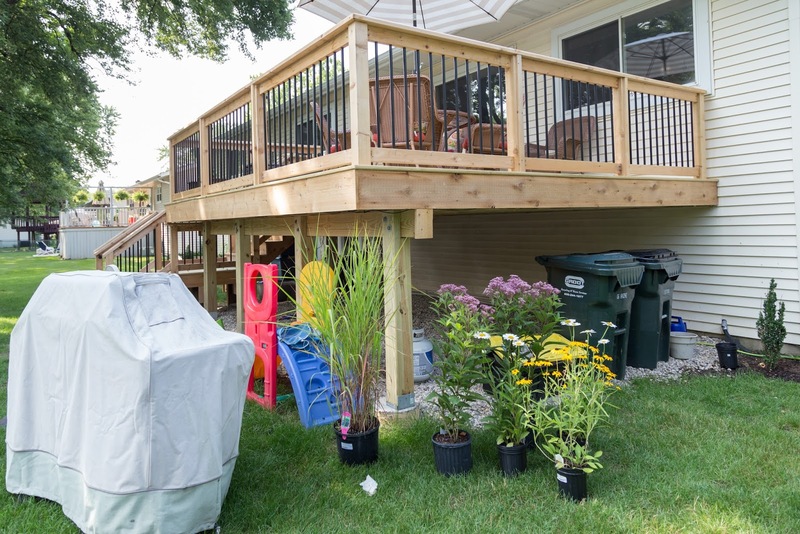 Whenever family or friends express surprise that we didn't just 'fix up the deck' I show them this photo. The stairs were absolutely falling apart, the stringer was totally cracked at the top, and of course they were sinking into the ground. 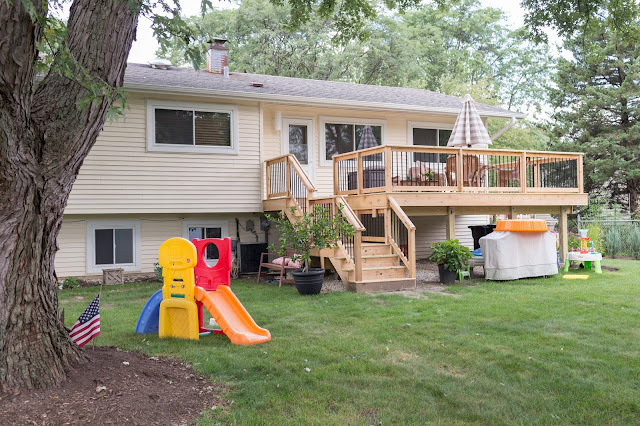 Not to mention all the rotted wood, we were finding more and more spots after the previous owner's attempt to camouflage the worn deck started peeling off. Are you thinking about trying 'Deck Over' on your old deck? I wouldn't recommend it! It peels off after one winter. 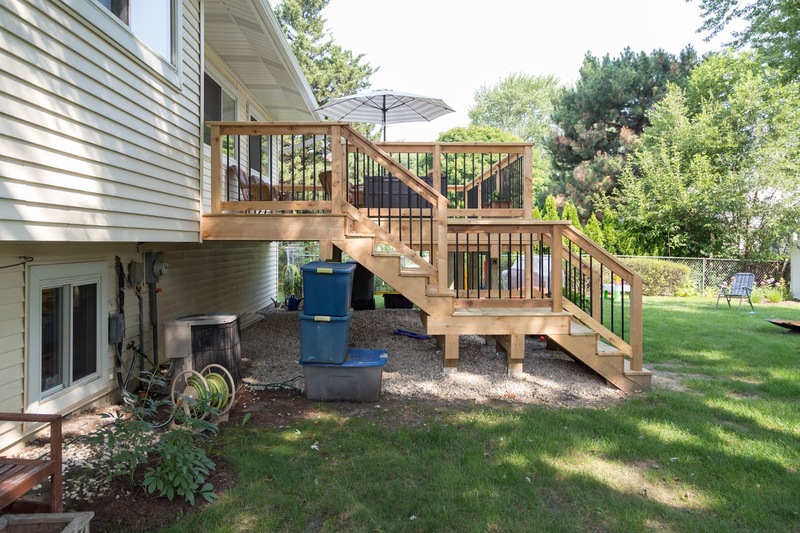 Rather than trying to fix what we had, and spend who knows how much making the stairway safe/replacing it, we decided to just replace the entire deck and enjoy it as long as we live here. 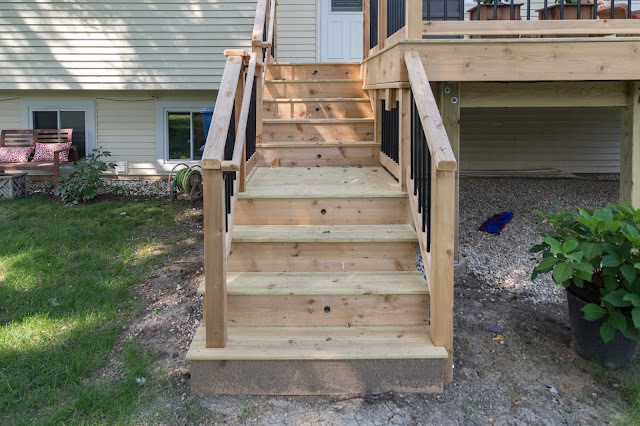 This way, we could configure the stairs in a more logical spot near the door, and we could make the deck bigger since we use it all the time. I had three contractors come bid, and two were very high (over 15K!) 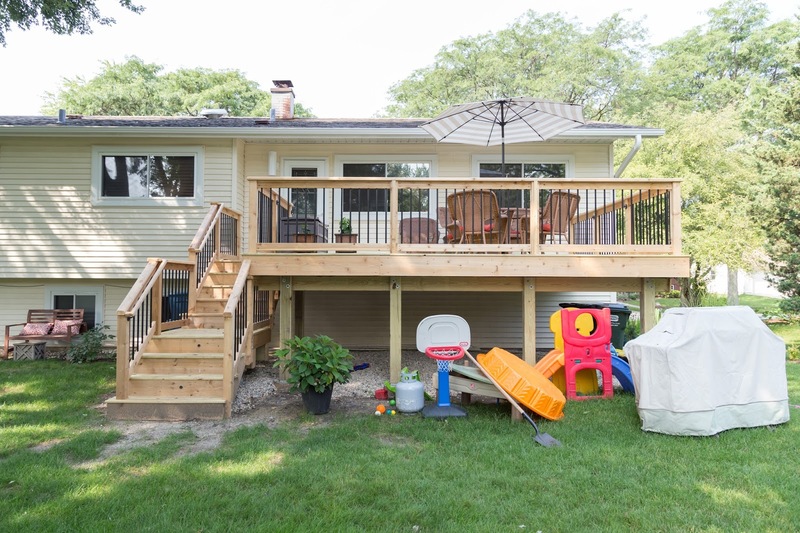 for a 21x14 deck, the third was around 9k and came recommended by neighbors, so we hired them. I won't lie, the process was terribly stressful. 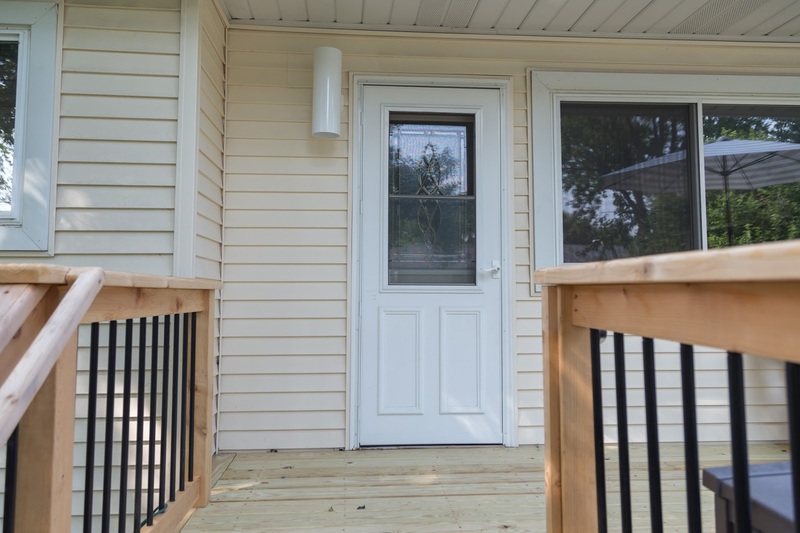 This hole in our siding was there for several days. I quickly found out why this company was so cheap. The communication was bad, and only about half of my requests made it from the owner to the guys doing the actual work. 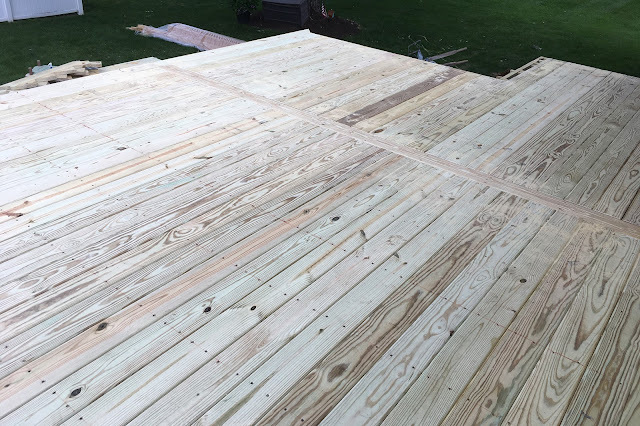 If I hadn't been home while they were working, the deck would not have been as long as it should be (I wanted it to reach the end of the dining room window) the far end would've been angled instead of straight, the stairs would've been in the wrong spot, and the Trex lighting would not have been added. Whew! Luckily, I was there and everything was done properly. 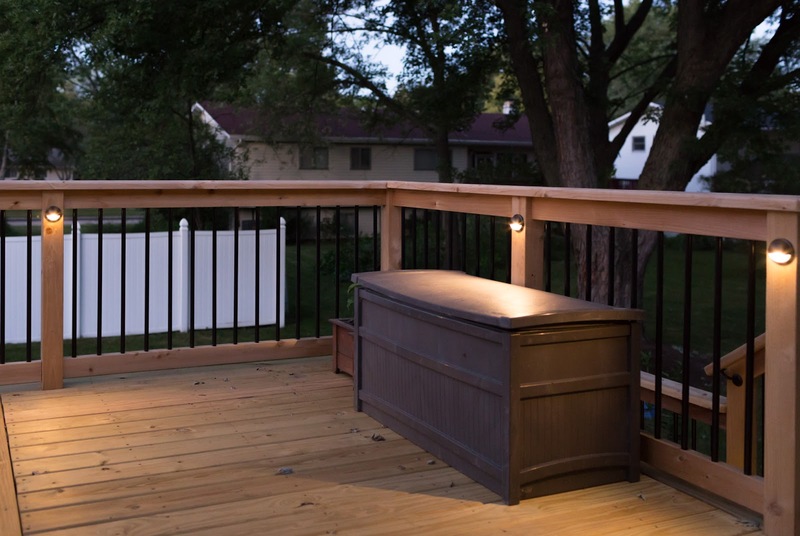 We don't like the look of composite decking, so we opted to go with pine decking and cedar railings. 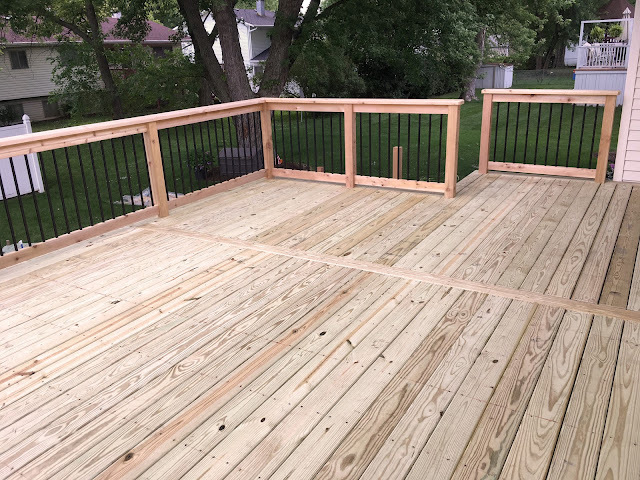 I didn't want cedar on the floor because of how easy it is to scratch, and our deck guy wouldn't do pine railings because of the tendency of pine to twist. He upgraded the railings to cedar for just a couple hundred extra. When it started coming together, it was very exciting! 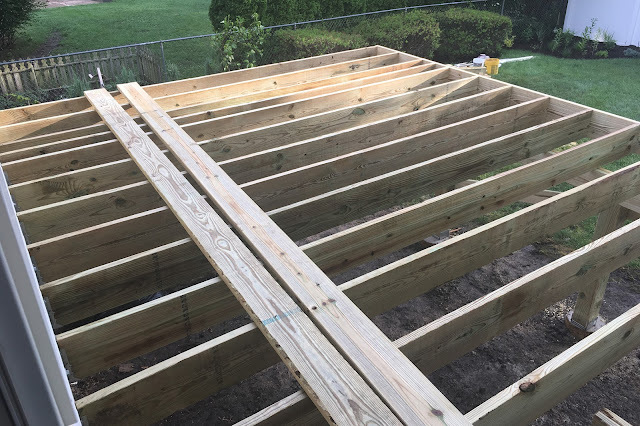 Our deck guy wrapped the entire frame with cedar at no cost, which was great because the pine framing is not attractive. You can see it half-wrapped above. At his suggestion, we did a landing for the stairway. If the kids fall, they will only go down 5 steps instead of 8! We totally love it. 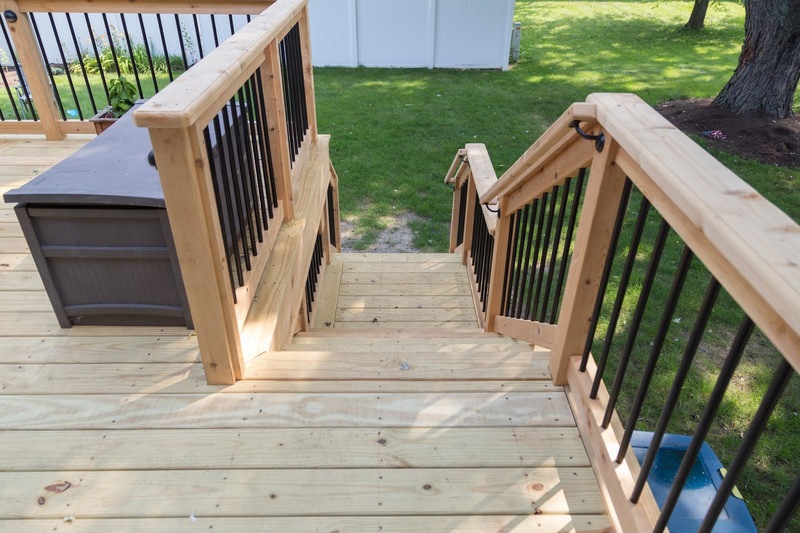 We opted for the modern black aluminum balusters, and we are so glad we paid a little extra for this. 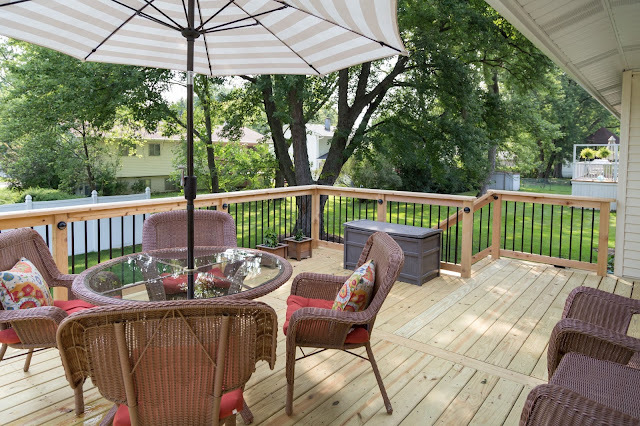 It totally changes the look of the deck. 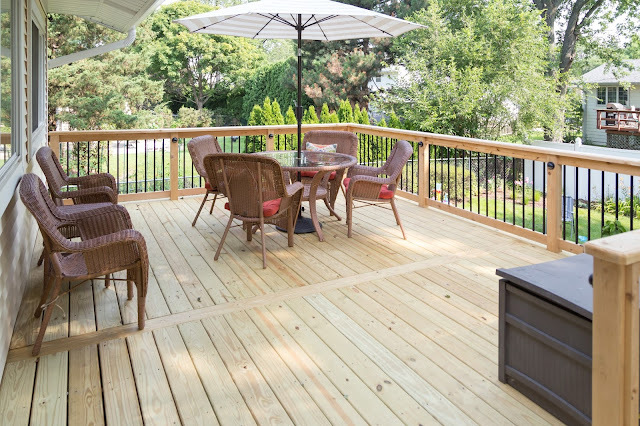 You can really see in this photo the difference in shade between the cedar railings and the pine decking. I will admit, I hate the difference, but I think once I stain/seal it will match better. The cedar is already starting to turn gray, so I'm going to be cleaning everything well this weekend and using Ready Seal on the entire thing. 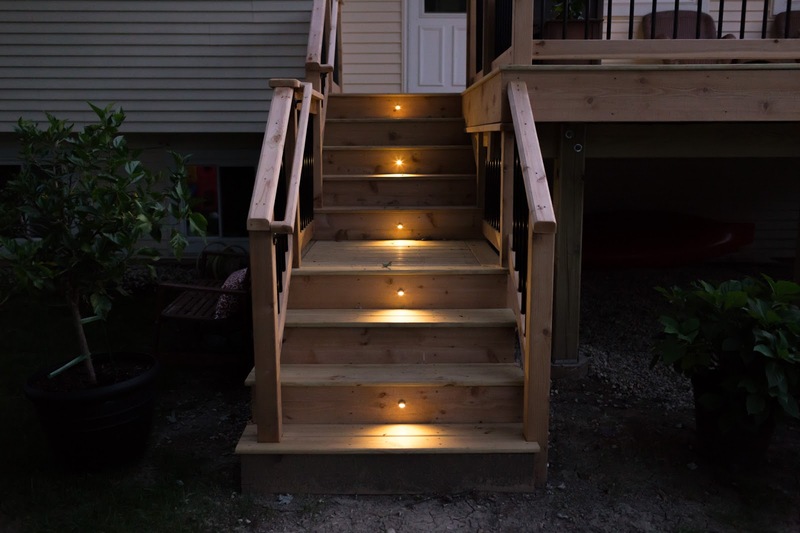 This is the company our deck builder recommended, and they send you a sample jar of all of their colors plus handy little swatches on cedar and pine for $15 shipping. Great deal! I'm going to post about that as soon as it's done. Until then, we are loving it all! Ok, I'm not loving my ugly chair cushions, and we are actually missing some. I desperately want new cushions and pillows, but we just can't spend any more money on this area this year. I think I will treat myself to some great ones next spring while the selection is huge. I don't have a close photo of the hideous light that was up here, but you can see it in one of the before pictures up top. I received a free cylinder light like we have in the front because they sent me an LED one rather than standard bulb. They don't want the incorrect one back, so I put the LED fixture back here. It's big, but it works great! Our stairs have low voltage lighting going down, and it is glorious at night. It looks so pretty, and will look so much better once all our clutter is put away. 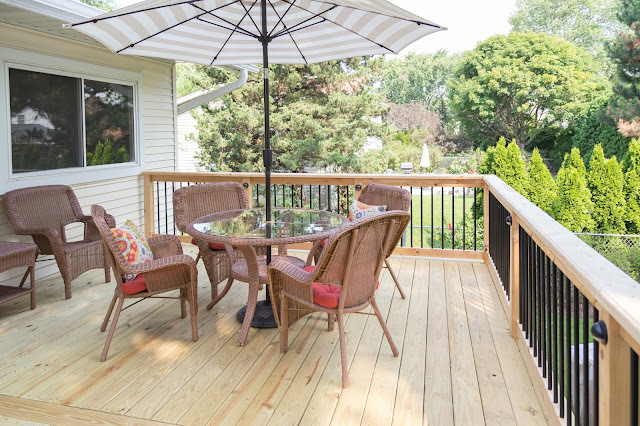 The landing makes the deck look so much fancier and pricier than it was! We plan to build a patio at the bottom of the deck, and the slight alcove created by the stairs extending past the deck makes a perfect area for planting. 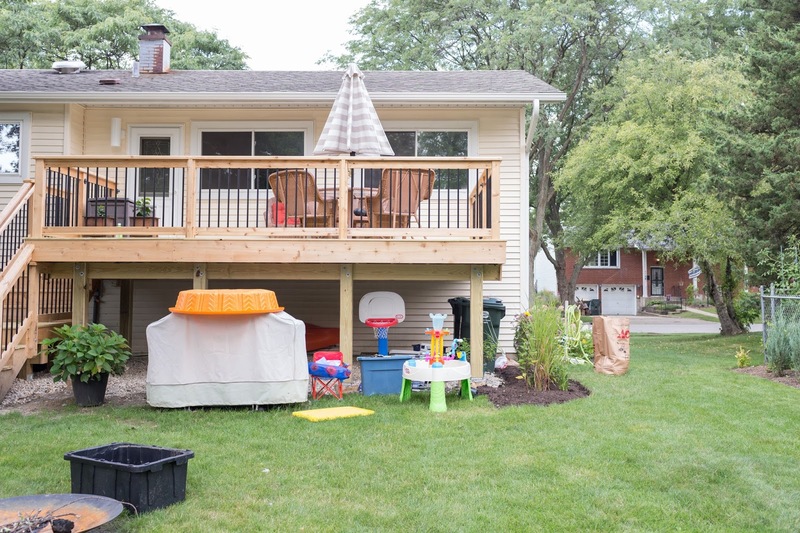 Right now, it's perfect for storing toys and our grill. 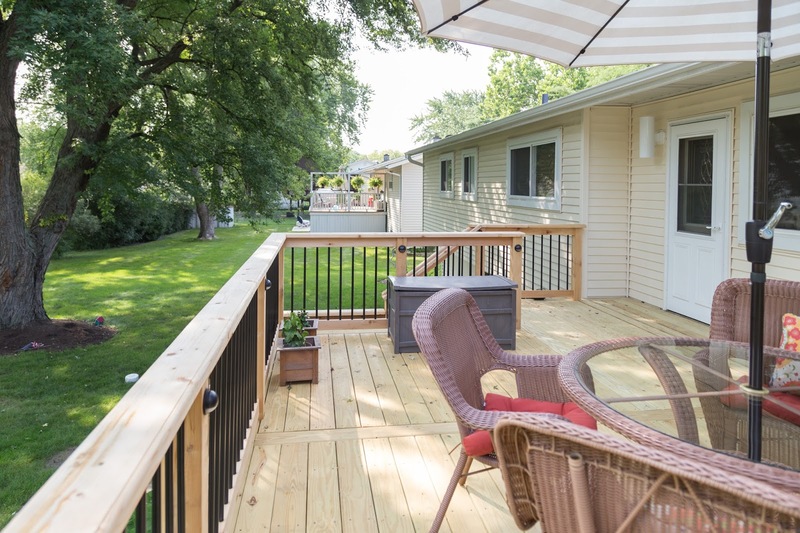 On this side of the deck, we were eager to cover the view of the river rock. Loose rock was not our first choice, but the guys doing the work didn't get the memo that we wanted crushed limestone so we could compact it. Remember those communication issues? Yeah, us too. 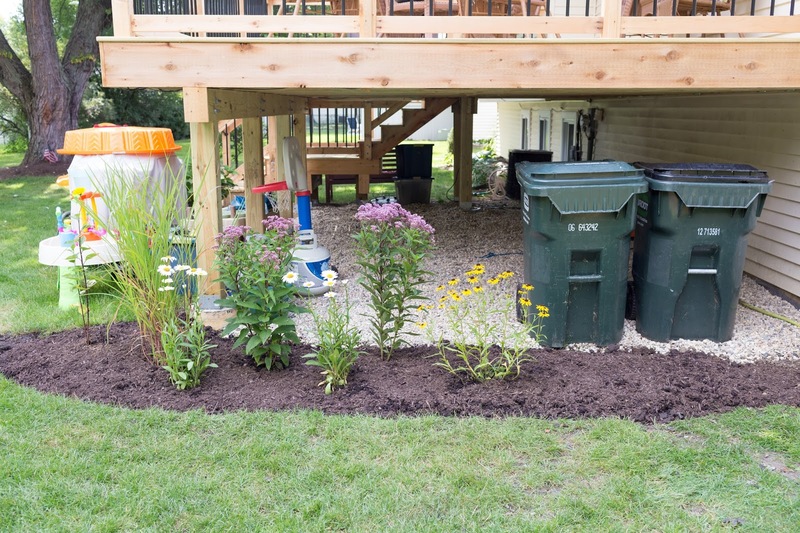 Anyway, I bought some nice native prairie perennials and we set to work digging out the grass and planting them. It was hard work, but we did it. Zach loved taking all the 'sod' and putting it in the lawn and leaf bags. He wouldn't wait for us to get most of the dirt off, so I hope the workers take these heavy bags! The planting area will wrap around the front side of the deck, we will worry about that next year. Almost everything I planted here is tall, the false sunflower on the corner can get 6 feet tall and 3 feet around! 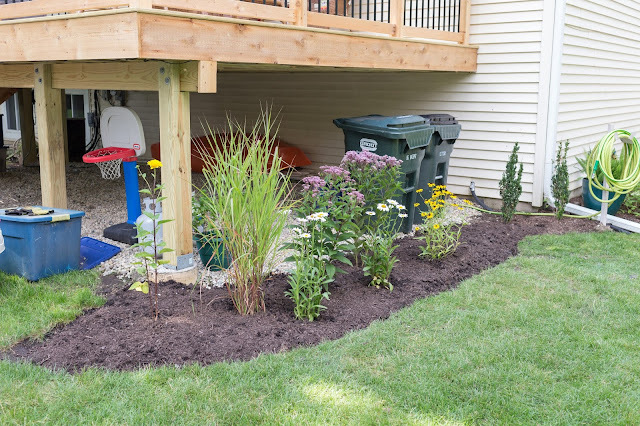 The purple flame grass get 4-5' tall, the Baby Joe Pye Weed is about 4' tall, the Shasta daisies are 3-4' tall, and the black eyed susan will stay about the height it is now. It is our ultimate plan to have the garbage and recycling cans live in the garage, but for now they just don't fit. We won't plant anything in front of the cans until they get into their new spot. 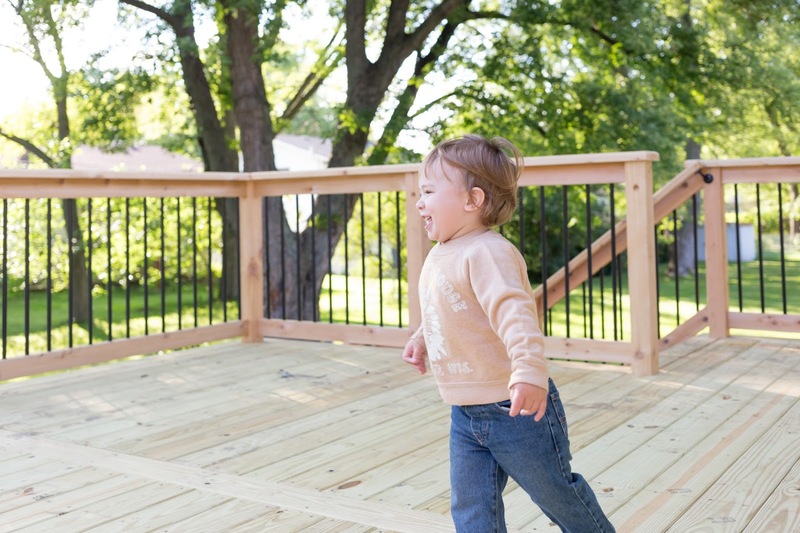 So far, the kids are pretty excited about the deck. There are still some rough spots and splintered wood around the screws that I have to take care of, but I'm mostly ok with them running around barefoot. Ok, only Zach comes out here because Ashford hates being outside. WHY?? It's so sad! And here is what it looks like at dusk with the lights on. Moody! 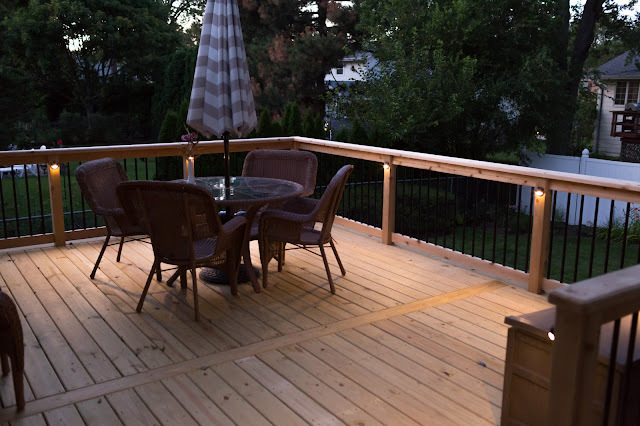 We eventually want to add some string lights, but for now, the deck post lights are awesome. And here are some fun before and afters for you. Wow! it's beautiful! What a difference! were the communication errors worth the savings? Thank you! Yes, it was worth it. I definitely would not recommend this company to anyone that wants to be hands off the project though. I definitely would not recommend this company to anyone that wants to be hands off the project, though! Simply spectacular! Love the night shots with the gorgeous lights. What a difference it makes to the property. Thanks, Mary! It has definitely changed my feelings about our house. I feel much happier to call this home now! Looks great! Is it past "Season" in your area? I've found AMAZING end of summer clearance on cushions at Lowes. Their clearance is the best! Gorgeous deck and plantings. You have a talent for design. I had to laugh at Ashford hating being outside. Yesterday, I told S to go play in the grass. He looked at me like I had 8 heads and said, "NO! There are bugs in the grass!!" FAIL. 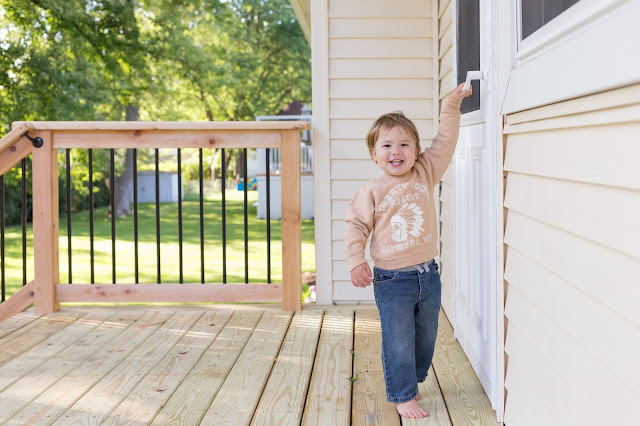 We signed him up for Nature Preschool this year one day a week and it cannot come fast enough.